As the time for summer pruning of apricots and cherry trees comes to an end, we thought we’d share with you a tip about one of the most important jobs to do when pruning – regardless of the time of year you do it. 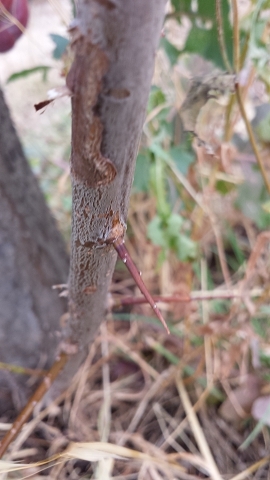 It’s really important to remove any suckers that are growing on your tree (that’s shoots coming up from below the graft union, or directly from the roots coming up through the soil). 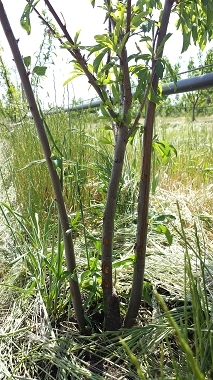 This is a little plum tree with two suckers coming up from the roots. Notice how they’re pretty much the same diameter as the original tree, and both are much taller? Just imagine, for a minute, what this scenario would look like in another year, or two, if the suckers were left intact. Within a very short space of time it would be increasingly difficult to tell which was the original grafted tree, and in fact there would be a good chance the original tree would be out-competed and die anyway. If you have a multi-trunked fruit tree in your garden, this is one of the common explanations for how it got there! That brings us to the second reason for getting this technique right. When you’re removing suckers, make sure you take them off as close to the trunk or the ground as you possible can – if you leave a stub, you’re just asking for trouble because it’s likely to turn into a forest of suckers next year! The third excellent reason to remove suckers is because they can be dangerous! The one we’ve photographed here had grown about 2m tall in just one season, right up through the middle of the tree, which not only takes much-needed vigour away from the tree, but provides a potentially painful hazard when you’re picking. 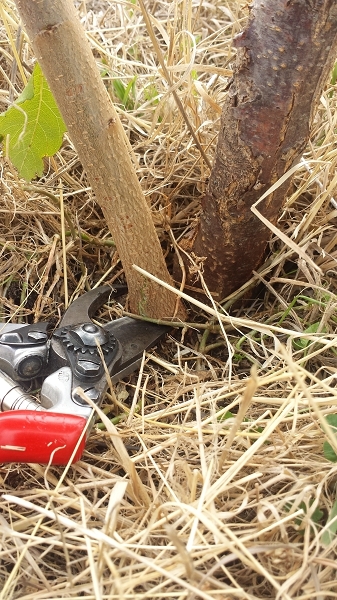 We’re all about making pruning as easy as possible, because we know it’s one of the topics that really befuddles a lot of fruit growers! 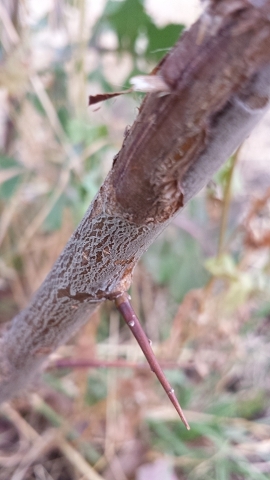 Removing suckers is just one of the techniques we teach in our Pruning Mature Fruit Trees short course (as well as our other pruning courses), because it really can make a huge difference to your trees. 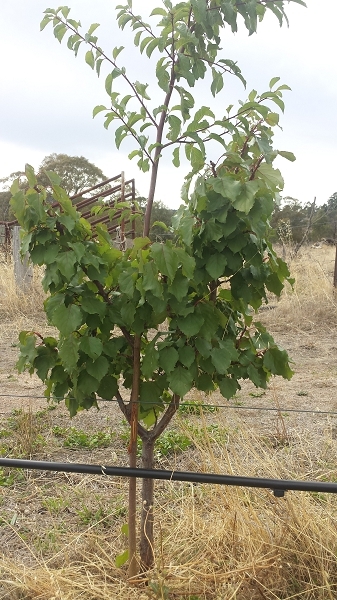 Autumn is an excellent time for soil improvement and preparation before we plant fruit trees in winter. There’s usually enough of a gap between when the harvest of summer fruit has finished (though you may still have apples and pears on the tree), and when planting happens in winter, to allow for planting an autumn green manure crop, for example. However, before you even start thinking about soil prep, there’s a few other steps you need to do. Did you get enough fruit to meet your goals? If not, why not — was it because of disease, lack of pollination, or just not enough trees? If you don’t know, we recommend keeping a fruit tree diary to help track of how your trees are performing. (You can download our Fruit Tree Diary template, plus instructions for using it, as part of the Learn to Diagnose Your Fruit Trees short course). After completing step 1 you should know whether you’re going to need more trees to help you grow the perfect amount of fruit to suit you and your family. There’s no point planting trees unless you actually need the fruit. You may have discovered that you need to choose a variety to fill a gap in production and provide a more continuous supply of fruit throughout the season (balancing out the periods of glut and scarcity). If pollination is an issue, you may be looking for a variety that can act as a pollinator to improve yields from an existing tree. Or you may be adding a type or variety of fruit that you normally have to buy. Having chosen the varieties you’ll be buying, now think about the best location in your garden for those varieties. For example, apricots and almonds need the most frost-protected spots, but they also need to be able to dry quickly in periods of rain in spring. Pears are relatively frost tolerant and reasonably tolerant of waterlogged soil.